Now, I like milkshakes in pretty much any form, whether it be malteds, concretes, frappes, white cows, velvets, frosteds – I even think that Kelis song is kinda catchy – but the mere sight of this monstrosity appalls me. It’s not just the heightened caloric intake problem, which is all to prevalent in fast food, it’s more the basic concept and visual sense. Look at those colors suspended in the shake… that artificial swirled topping that looks like it was crapped out of a chocolate bunny… the texture of the mélange itself which seems like it would have the mouthfeel of ground up carpet and Reddi-wip. I can’t imagine putting this in my mouth short of someone holding a loaded gun to my head and even then I might just roll the dice. Yet it will probably sell. Americans are gluttonous, gullible consumers and all it takes is a moderate TV ad campaign or an in-restaurant poster to make someone order this fatty colon caulk. But not me. 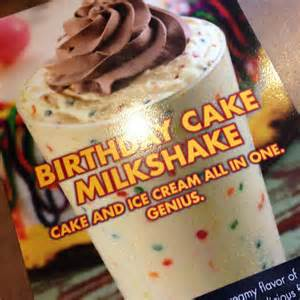 I will eschew the Birthday Cake Milkshake for less disturbing fare. What? DQ has a new Salted Caramel Truffle Blizzard? Moira, get me my car keys! This entry was posted on April 11, 2015 at 12:55 am and is filed under Humor. You can follow any responses to this entry through the RSS 2.0 feed. Responses are currently closed, but you can trackback from your own site.